It was conducted on a large, specially-designed hanging platform. The executed Native Americans were members of the so-called Dakota Sioux. On this day in 1862, as many as 38 Native Americans were simultaneously executed by hanging. It was the largest mass hanging in the history of the USA. 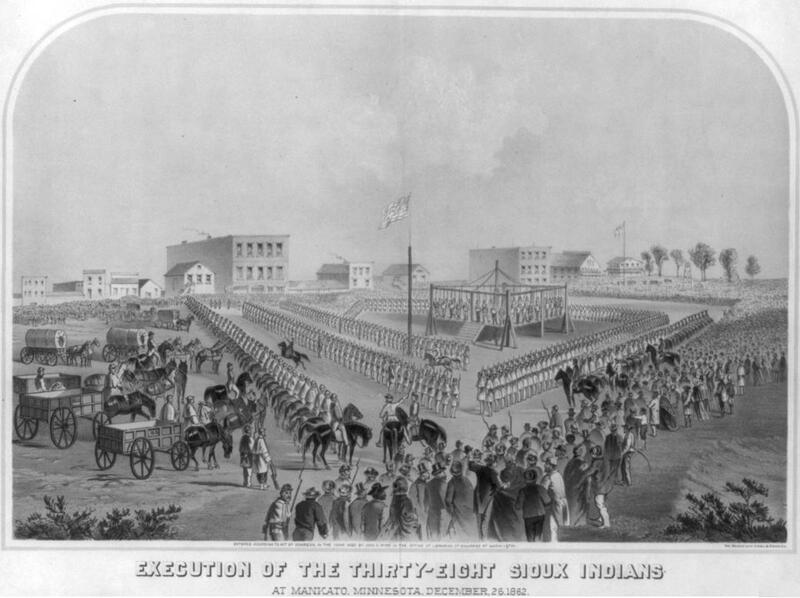 The execution took place in the town of Mankato in what is now Minnesota. The site is located some 100 kilometers southwest of Minneapolis. The execution was conducted large, specially-designed hanging platform. The executed Native Americans were members of the so-called Dakota Sioux who had previously been captured by the Americans. They were captured in the so-called Dakota War of 1862, which took place simultaneously with the American Civil War – the Dakota were fighting against the Union’s troops. The Dakota were eventually defeated in the war. The next year (1963), the remaining Sioux were driven from the territory of what is now Minnesota, and into South Dakota in Nebraska. Of course, the states of North and South Dakota were named after the aforementioned Dakota Sioux.